The most important factor in maintaining and preserving carpets is to keep them clean. Dirt and contaminations not only diminish their beauty and appearance but also cause damage to them. It obvious that carpets with a light background and high pile or those that are exposed to dirt and wear need to be cleaned more often. Powerful vacuum cleaners with rotary brushes should not be used to clean the rugs as these may loosen the knots and cause them to be used. It’s also recommended to vacuum the back of the rug, once every few months. Water and humidity can cause damage to a carpet. Whatever the cause maybe, on this occasion the steps which should be taken at once are: with towel , or a non –dyed cloth sponge the excess water until completely absorbed on the both sides. Then this area should be dried with hair- dryer , the heat of which should not be strong or it should be exposed to a moderate sun. After this process, by rubbing with fingers, the pile of the wet carpet can be reset to its previous position. If tea , coffee, juices, alcohol , shoes polish or any greasy substance stains a carpet, the first step is to absorb it immediately with a non – dyed cloth, blotting paper or tissue paper. 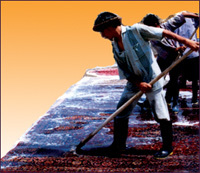 Sponging with wool or silk and s compatible solution for removing the specific substance (tea,wine ,and grease) should be done till the colouring substance has been wiped off. Each of the stain has a different technique for removing it. 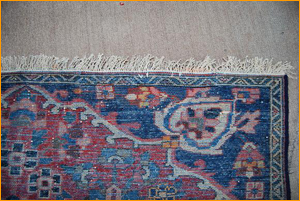 Many common substances are best removed from the rugs and carpets with the following methods. Solf drink,milk , coffee, tea, alcohol and chocolate can be removed by mixture of lukewarm water and soap or non-alkaline detergents . Eggs and bloodstains can be removed with mixture of salt, non- alkaline detergent and lukewarm water. Human and animal urine is best removed with white vinegar with lukewarm water. Clean grease, shoe polish and fatty substances with non-alkaline detergent and white vinegar. 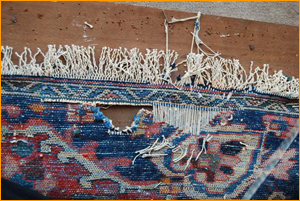 The most importance factor to preserve carpets and rugs for a life time and future generations is to keep them clean, to take good care and restore them immediately when damage or rotted. Normally a carpet should be washed every two or three years. 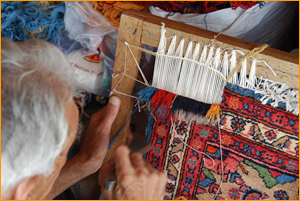 When touch by hand, if the pile and the fiber of the rug are rough and sticky or totally dirty, depending where the carpet has been spread and the frequency of its wear and tear, then the time has come for it to be washed. 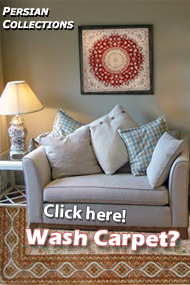 Rugs should be washed only in specialized professional rug-cleaning companies and never send to dry –cleaners. The solution used by the dry-cleaner ruins the wool, the warp and weft. Keep the carpet protected from sunrays by heavy curtain or shutters. No object that is damp or likely to cause dampness should be places on the carpet. To prevent localised wear and tear, occasionally move or turn the carpets so that the normal pattern of the traffic is spread uniformly over different parts pf the carpet. Carpets should not be spread under doors. The lack of space between the bottom of the door and the carpet can cause the carpet to fold and suffer excessive wear and tear. On hard surfaces such as marble or linoleum the carpet should have an underlay or padding made of polyester to prevent sliding of the carpet, especially silk carpets. The runners that are placed on the stairs must be fixed on both sides with metal rods to prevent them from sliding. Once in the while the runners should be pulled by a few centimeters up or down to ensure uniform wear and tear. If the carpet is spread over stone surface or on mosaic, it should be ensured that the joints are not sharp and uneven. The leg of a chair ,sofa, table or any other heavy item of furniture damages the pile of the carpet. A small piece of linoleum, wood or other similar type of material should be put under the legs of these objects to protect wear and tear of the carpet. Keep the carpets clean. It’s the most important recommendation. Cleanliness ensures longevity and perfect form. PERSIAN COLLECTIONS, We sell, trade, restore, wash & appraise new and antique carpets. 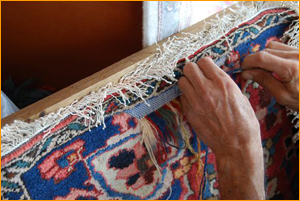 We are expert for carpet / rug cleaning and also restoration.